Plastic islands in our oceans, melting glaciers, exploited workers – our consumption habits in the here and now have catastrophic consequences across the entire planet. In everyday life, however, it’s amazingly simple to just ignore that fact entirely. These pictures of the damage, however, won’t so easily be erased from your memory. Palm oil is in nearly every second product at the supermarket – from shampoo to pizza. It’s typically produced on large monoculture plantations in Southeast Asia, for which rainforest is being cleared at alarming rates. Orangutans and other animals are thus losing their homes. The orangutan in this picture was rescued from starvation in a cleared rainforest grove on Borneo by activists. But not every animal will be so lucky – and everyone who purchases products with conventionally harvested palm oil is contributing to this catastrophe. The majority of our clothing is now produced in Asia, where environmental standards are often low and inspections often weak. Textile and leather factories like this one in Kanpur, India, regularly release highly toxic wastewater directly into local rivers. If you are not purposefully buying clothing from brands that produce ecologically and transparently, you unfortunately must accept that your clothing is also destroying someone else’s local environment. It seems like nearly everything in the modern world of consumption is plastic-wrapped. And even if you say, “I always put my waste in the trash can,” every single one of us in the developed world contributes to the growing plastic islands in our oceans. This shocking photo was taken by photographer Zak Noyle in Indonesia – in the hope that our wave of trash could turn into a “wave of change” by raising consciousness about the problem of oceanic plastic waste. Some environmentalists now believe that worldwide plastic pollution is as large a threat as climate change. This waste is destroying ecosystems and endangering the lives of ocean creatures. “This is a photo I wish didn’t exist. But since it does exist, I want everyone to see it,” commented photographer Justin Hofmann on his snapshot of a seahorse holding a cotton swab. He took the picture off the island of Sumbawa in Indonesia. He discovered the seahorse and wanted to take a picture of it alone, but the rising tide washed in a pile of trash which quickly flooded the animal’s environment. Sandy, Haiyan, Matthew, Harvey, Irma, and most recently Maria: In the last few years, the Earth has seen an extreme number of extremely devastating tropical storms. Yet there’s more behind their destructiveness than just weird weather: Climate change caused by our lifestyles and consumption practices doesn’t just cause world temperatures and ocean levels to rise. Extreme weather events like storms and droughts also become stronger and more destructive – and these effects are felt everywhere, not just on the other side of the planet. Americans dispose of nearly 115 tons of food every minute of every day — one third of all food stuffs in the US lands in the trash, according to the Guardian. More than half of all food waste could be prevented, according to WWF. As consumers, our biggest role is to be more thoughtful about food generally. That means shopping consciously, not immediately tossing anything that doesn’t look perfect, and often ignoring the erroneous “best by” dates printed on foods! Most Americans love to eat as much meat as possible at the lowest price available. That enjoyment is only possible at the cost of miserable living conditions for the animals in factory farms – chickens, pigs, and cows alike. Trapped in the smallest of spaces without any freedom to move or occupy themselves in a natural manner, bred to grotesque body proportions, treated with antibiotics and fed with genetically modified soy from South America: Animals raised in this new “conventional” style suffer enormously – and the environment along with them. All this so that we can eat daily servings of meat. “It tastes so good” and “organic is way too expensive,” right? Every meat eater should watch the 360-degree film “iAnimal,” which shows the world through the eyes of a factory-farmed pig. We are constantly starving for ever newer versions of smartphones, televisions, laptops, and tablets we already own. As soon as our devices show any sign of weakness, we cast them off. Despite bans on waste exports, the sheer scale of the problem means that tons of Western electronics still make their way to Africa each year. Unprotected workers and children disassemble the electronics in order to reclaim valuable raw materials within. Massive areas of land have been polluted by the poisonous substances released when burning or otherwise taking apart these electronics. Agbogbloshie, Ghana, has thus become a tragic symbol of our societal discarding frenzy. An Atlantic report from 2014 describes the dire situation there. This short video from the BBC shows how boys and men in Agbogbloshie are exposed to heavy metals and poisonous smoke in order to extract copper from Western electronic waste. Bits of plastic and other plastic waste arrive in our oceans by many means. For ocean life like fish, whales, sea birds, and sea turtles, this trash can be deadly: they become entangled or wounded by it or inadvertently swallow it. This turtle solemnly earned celebrity as a symbol of the plastic waste crisis. It got caught in a plastic ring when it was just a baby. Its shell and body then grew abnormally around the ring. The picture is extreme – and the number of animals suffering due to plastic waste in our oceans is equally so: According to the German Environmental Agency, every year up to 100,000 marine mammals and one million sea birds die as a result of garbage. At least 136 types of sea life are known victims of entanglement and strangulation at the hands of plastic waste. At least 43 percent of all whale and dolphin types, over one third of sea birds, every type of sea turtle, and many types of fish inadvertently swallow garbage. 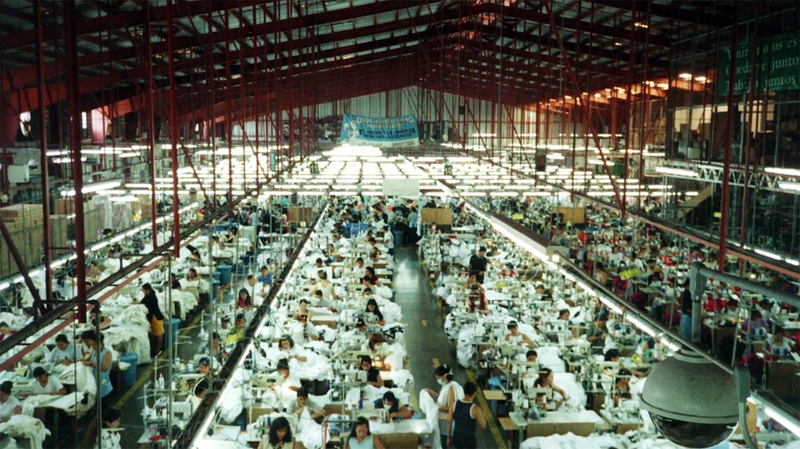 As cheaply as we can buy clothes, you would never imagine how dearly others pay for it: like the textile workers, usually female, in factories in Bangladesh, China, and other low-wage countries. These innumerable, anonymous seamstresses create your wardrobe for starvation wages, working long hours with no overtime pay in decrepit buildings without any form of security – personal or social. It doesn’t matter where you shop: if you don’t purchase your clothing from fair fashion labels, you must reckon with the fact that your clothing was made under exactly these conditions. One alternative: buy used clothing! This reduces the demand for new production. As we all know, our wasteful consumerism – our meat consumption, our oil usage, our coal-powered factories – has made us complicit in climate change. Two of the hardest-hit victims are the Earth’s North and South Poles. Glaciers in the Arctic and Antarctic are melting at astonishing rates, threatening the homes of humans and animals alike. One sad symbol of this development is this starving polar bear. Photographer Kerstin Langenberger took this picture in Norway in 2015. Child labor is still widespread and a problem in many industries. Indeed, things which are small luxuries in our daily lives are often products of child labor on the other side of the world: cocoa, coffee, and tobacco, for example. The only way to ensure that children were not involved in the production of your favorite treats is to purchase fair trade goods or at the very least to pay attention to their countries of origin.